Then join us at 9:10 AM Eastern on Spirit Catholic Radio (listen live) for the Good Book Club as we discuss Luke 23:44-56. The topic is the Death and Burial of Jesus. Lots of cool insights and typology that most people don’t know. Then Mater Dei in the Northwest at 11:00 AM. 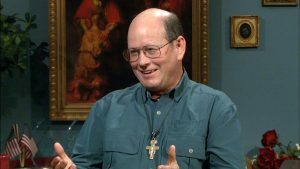 Then at 2:00 PM Eastern I will join the Terry & Jesse show on EWTN to discuss my “Seven Rules for Dealing with Non-Catholic Family and Friends.” Call in with you questions and comments. You can read my article “Six Rules” here. The article mentions only Six Rules – I have added a new one since. Listen in to see what Rule #7 is. Lastly at 5:50 Eastern time I will discuss the saddening news from Pittsburg about the lack of committed Catholics and the drop in Mass attendance. Drew and I will talk about evangelization.